Chanteuse Country Canadienne née Lisa Ann Brokop, le 6 Juin 1973 à Surrey (British Columbia). Lisa Brokop was born in Surrey, British Columbia, in 1973. Born into a musical family, Brokop was on-stage with her accordion-playing mother by age 7, performing polkas and popular country hits like "The Gambler." By 15, she was gigging throughout the thriving country music scene in Vancouver, both as a singer and guitar player, and soon began issuing her own singles. 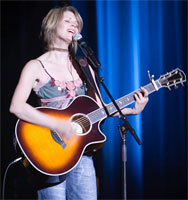 Her debut Canadian album appeared in 1991, when Brokop was only 17. A year later, the young country singer headed for Nashville. Making it look easy, a 30-minute showcase at a local club and a performance on TNN's Ralph Emory Show was all it took to land Brokop a deal with Capitol-Nashville, and in 1994 the label issued her proper Nashville debut. Every Little Girl's Dream was produced by Jerry Crutchfield, and found moderate success with its singles Give Me a Ring Sometime and Take That. A self-titled effort followed in 1995, spawning the singles Before He Kissed Me and She Can't Save Him. There was no question that Brokop had already achieved more Nashville success than many who brought their dreams to the city. But at 22, she was burned out. Brokop ended her relationship with Capitol and took some time off to work on her own songwriting. In 1998, Brokop returned to the spotlight. Now with Columbia, she issued the CD-5/EP When You Get to Be You. 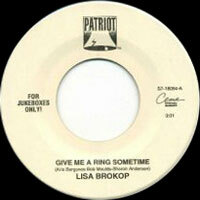 While the release did well in her native Canada, Columbia chose not to release it in the U.S. Evidently, the Columbia deal wasn't the right fit either, because when Brokop next surfaced, it was with the 2000 LP Undeniable, released through her own Cosmo label and available only in Canada or through her website. However, the record was a success in her home country, and Brokop continued to tour in support of it through 2003.